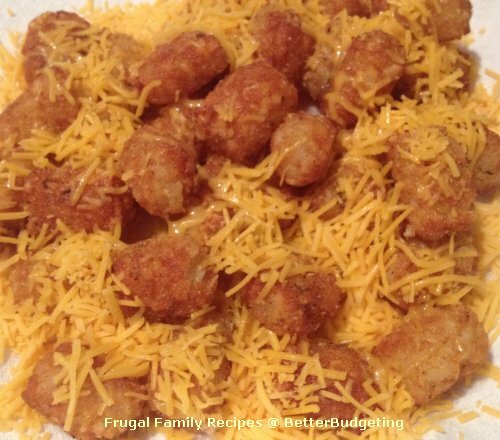 Frugal Family Recipes From BetterBudgeting: Easy Cheesy Tots - without an Oven! Easy Cheesy Tots - without an Oven! No oven or fryer needed for our easy cheesy tots, and the addition of Sharp Cheddar makes them simply irresistible! Heat large saucepan over med-high heat with vegetable oil. Gently add frozen tots and cook until crispy and done (turn tots gently with spatula as needed, being careful not to break them up). Remove from pan and drain on paper towels. Place tots on serving plate while still very warm and sprinkle generously with finely shredded Sharp Cheddar cheese. The cheese will begin to melt immediately.